BEFORE: Countdown to Zero is the documentary du jour. While this probably would have fit in better with the other war-themed films at the beginning of this U.S. subchain, it’s nonetheless being watched today, the penultimate day of this 2+ week documentary chain. AFTER: This is yet another documentary with an agenda. Instead of fixing the education system or the food industry, the mission here is to get the world’s nuclear powers to decrease their nuclear arsenals, eventually down to zero. If you’re looking for a detailed history into the creation of the atomic bomb and the Manhattan Project, this is not the documentary. 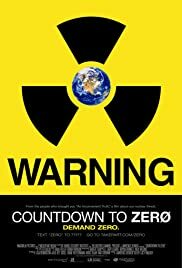 Countdown to Zero takes a broader approach covering the history from the 1940s to the present instead of specific events like it’s creation or the detonation of “Little Boy” and “Fat Man” in 1945. By taking this approach, this allows for some shocking discoveries when you realize how many false alarms and other accidents have brought us to the brink of nuclear destruction. Forgoing the use of a narrator, the interviews dictate the direction of the documentary combined with a variety of b-roll. The quality fluctuates throughout the film varying from entertaining and informative to boring and confusing. When the interviewees are given enough time to flesh out their ideas and combined with relevant b-roll (e.g. footage of operators going through a launch procedure), it was fun to watch. But there were also many times where the interviews were cut together so tightly that one voice was overlapping the next. And, that would be combined with irrelevant footage of people walking around a city. The intent is to give the impression that if a nuclear strike were to happen, it could happen in any city at any time and everyone in the targeted city would be killed instantly. However, it just felt out of place and unnecessary. The film didn’t need footage to get that idea across; it was already apparent from the interviews. While far from perfect, Countdown to Zero serves as a good starting point to the history of nuclear weapons and why we should aim for further reductions in the stockpiles of these weapons.